This idea, called "entanglement," is part of the branch of physics called quantum mechanics, a description of the way the world works at the level of atoms and particles that are even smaller. Quantum mechanics says that at these very tiny scales, some properties of particles are based entirely on probability. In other words, nothing is certain until it happens. Albert Einstein did not entirely believe that the laws of quantum mechanics described reality. He and others postulated that there must be some hidden variables at work, which would allow quantum systems to be predictable. In 1964, however, John Bell published the idea that any model of physical reality with such hidden variables also must allow for the instantaneous influence of one particle on another. While Einstein proved that information cannot travel faster than the speed of light, particles can still affect each other when they are far apart according to Bell. Scientists consider Bell's theorem an important foundation for modern physics. While many experiments have taken place to try to prove his theorem, no one was able to run a full, proper test of the experiment Bell would have needed until recently. In 2015, three separate studies were published on this topic, all consistent with the predictions of quantum mechanics and entanglement. "What's exciting is that in some sense, we're doing experimental philosophy," said Krister Shalm, physicist with the National Institute of Standards and Technology (NIST), Boulder, Colorado. Shalm is lead author on one of the 2015 studies testing Bell's theorem. "Humans have always had certain expectations of how the world works, and when quantum mechanics came along, it seemed to behave differently." The paper by Shalm, Marsili and colleagues was published in the journal Physical Review Letters, with the mind-bending title "Strong Loophole-Free Test of Local Realism." "Our paper and the other two published last year show that Bell was right: any model of the world that contains hidden variables must also allow for entangled particles to influence one another at a distance," said Francesco Marsili of NASA's Jet Propulsion Laboratory in Pasadena, California, who collaborated with Shalm. Imagine that A and B are entangled photons. A is sent to Alice and B is sent to Bob, who are located 607 feet (185 meters) apart. Alice and Bob poke and prod at their photons in all kinds of ways to get a sense of their properties. Without talking to each other, they then each randomly decide how to measure their photons, using random number generators to guide their decisions. When Alice and Bob compare notes, they are surprised to find that the results of their independent experiments are correlated. In other words, even at a distance, measuring one photon of the entangled pair affects the properties of the other photon. 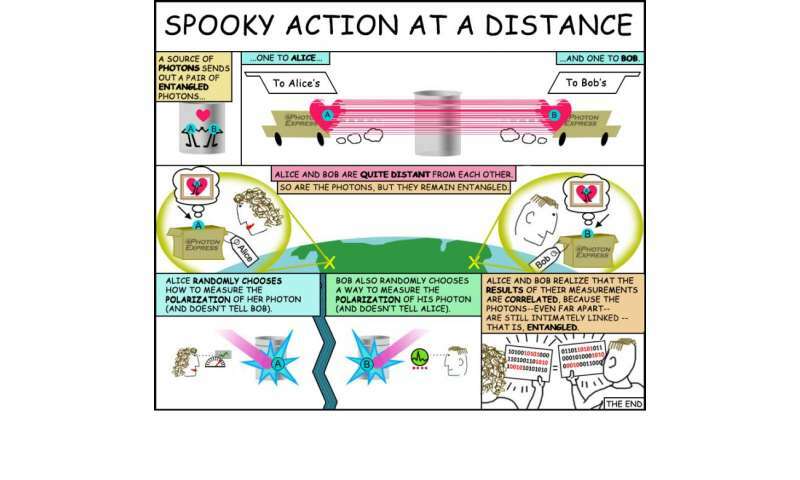 "It's as if Alice and Bob try to tear the two photons apart, but their love still persists," Shalm said. In other words, the entangled photons behave as if they are two parts of a single system, even when separated in space. Alice and Bob—representing actual photon detectors—then repeat this with many other pairs of entangled photons, and the phenomenon persists. To make this experiment happen in a laboratory, the big challenge is to avoid losing photons as they get sent to the Alice and Bob detectors through an optical fiber. JPL and NIST developed SNSPDs with worldrecord performance, demonstrating more than 90 percent efficiency and low "jitter," or uncertainty on the time of arrival of a photon. This experiment would not have been possible without SNSPDs. The design of this experiment could potentially be used in cryptography—making information and communications secure—as it involves generating random numbers. "The same experiment that tells us something deep about how the world is constructed also can be used for these applications that require you to keep your information safe," Shalm said. "Right now we have the Deep Space Network to communicate with spacecraft around the solar system, which encodes information in radio signals. With optical communications, we could increase the data rate of that network 10- to 100-fold," Marsili said. Deep space optical communication using technology similar to the detectors in Marsili's experiment was demonstrated with NASA's Lunar Atmosphere Dust and Environment Explorer (LADEE) mission, which orbited the moon from October 2013 to April 2014. A technology mission called the Lunar Laser Communication Demonstration, with components on LADEE and on the ground, downlinked data encoded in laser pulses, and made use of ground receivers based on SNSPDs. NASA's Space Technology Mission Directorate is working on the Laser Communications Relay Demonstration (LCRD) mission. The mission proposes to revolutionize the way we send and receive data, video and other information, using lasers to encode and transmit data at rates 10 to 100 times faster than today's fastest radio-frequency systems, using significantly less mass and power. "Information can never travel faster than the speed of light—Einstein was right about that. But through optical communications research, we can increase the amount of information we send back from space," Marsili said. "The fact that the detectors from our experiment have this application creates great synergy between the two endeavors." 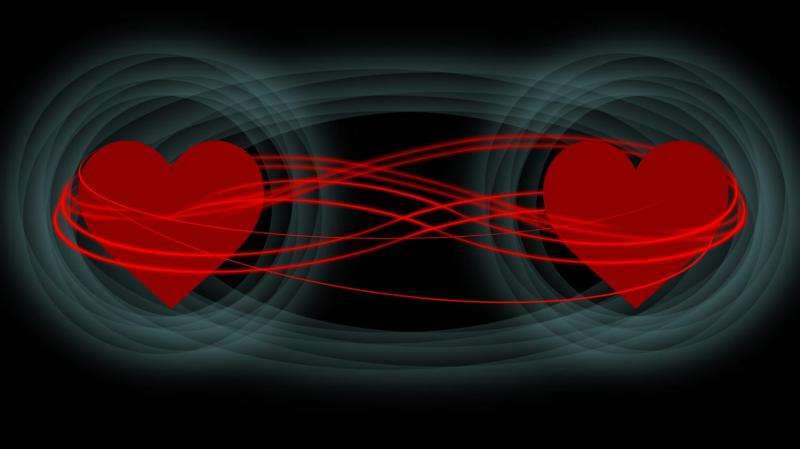 And so, what began as the study of "love" between particles is contributing to innovations in communications between space and Earth. "Love makes the world go 'round," and it may, in a sense, help us learn about other worlds.